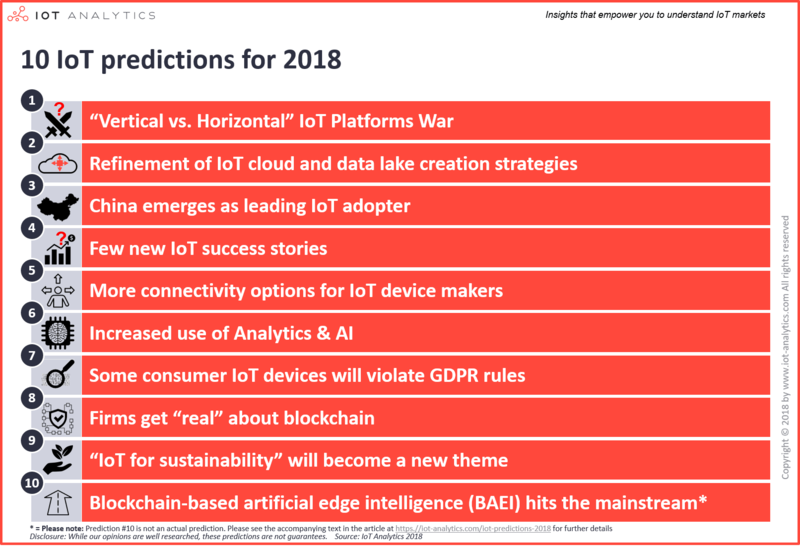 After highlighting the top 10 stories of IoT in 2017, the IoT Analytics team looks back at the IoT predictions they made a year ago and ventures a prognosis on the 10 things that seem likely for IoT in 2018. Last year, we at IoT Analytics, made 4 IoT predictions (as part of the 2016 in review article) of which we believe most did turn into reality (Except IoT prediction #3). The 2017 view: We predicted that many large IoT platform providers would be gearing up for a war for IoT (platform) leadership. The 2018 view: The war did intensify in 2017 with price cuts and new entrants. A year later we can already see first winners of that war (Microsoft and Amazon). The 2017 view: New telco-backed low-power standards would go head-to-head with existing LPWAN technology such as Sigfox or LoRa. The 2018 view: Many TelCo firms announced new NB-IoT / LTE-M roll-outs that compete with Sigfox and Lora in 2017. There are no winners just yet but the heat is clearly on. The 2017 view: We expected the first real-life case studies for industrial Augmented Reality and Virtual Reality in 2017. The 2018 view: IoT Analytics was too bullish on this topic. Real-life use cases were extremely limited in 2017 with much less activity than anticipated. The 2017 view: We predicted that the IoT hype would cool off and attention would shift from vendor/infrastructure topics such as what the next generation of platforms or connectivity standards will look like towards actual implementations and case studies. The 2018 view: The hype did cool off: In 2017, Gartner cut its outlook for number of connected devices as Blockchain and AI became “hotter” topics than IoT. Reality kicked in: Cisco published a report that highlighted that almost 3 out of 4 IoT projects are failing. Horizontal platforms have been the early winners of the IoT platform wars. The horizontal cloud platforms of Amazon and Microsoft are growing at exuberant rates and enjoy tremendous acceptance in the industrial IoT developer community. Vertical IoT platforms have so far been playing second fiddle. Even though a number of startups initially focused successfully on specific use cases and verticals, very few of them still do. Most of them now market themselves as a universal IoT platform (e.g., C3IoT initially focused on predictive maintenance in the energy vertical and now markets itself as a general AI&IoT Platform, thethings.io started as a Smart City IoT platform and now markets itself as an IoT platform to monetize all kind of devices). It seems that, right now, the value of being able to provide a complete tech stack offering and the ability to scale quickly outweighs domain expertise. We see a potential that this may change and the IoT world gets separated into those that believe in the “horizontal” approach and those that believe in the “vertical” approach. Vertical platforms may prevail for two reasons: a.) Their digital twins and data models are contextualized for specific uses cases so they become the only ones that can really make use of the power of analytics and AI b.) They manage to build up industry specific app stores that supply a domain with various critical applications that they require for operations (e.g., in the case of manufacturing industries they may not only provide new predictive maintenance applications but also offer next-generation MES and asset management systems that replace existing ones). Some people cite “domain specific device interoperability” as a third reason. This advantage is, however, vanishing. By now, most horizontal platforms support all major protocols in various industries or otherwise cooperate with gateway manufacturers who do the job in each vertical. Some firms have already moved a significant portion of their operations to the cloud and many others will follow. Cloud environments provide a number of benefits such as cheap storage, compute performance and (by now) security. The question remains which part of the organizational and IoT data should move to private cloud environments and which can go into a public environment. The answer is mostly a mix of both (hybrid). Rather than focusing on solving the enterprise backend for individual IoT use cases, many IT departments understand that it requires a holistic data and cloud strategy to get organizations ready for the age of massive IoT data. Developing IoT solutions often means that firms require data they previously didn’t consider to be important (e.g., Predictive Maintenance algorithms improve the longer one can look back into past equipment failures) On top of that, most data scientists complain that a large portion of their job is to aggregate and prepare data. That is why many firms in 2018 will engage in the creation of a unified “data lake” in the cloud that aggregates all IoT and non-IoT data and lays the foundation for future IoT & digital initiatives. Over the last 50 odd years, China has made a transition from being known as a low-cost low-quality manufacturing hub towards becoming a global technology power. Recently, Apple and Samsung have continuously lost market share to Chinese smartphone incumbents. In other high-tech industries, China has already achieved world dominance, most notably in solar panels. China was also the first country to announce widespread government support for the Internet of Things (March 2011 as part of the “12th five year plan”) which included specific funding and a set of IoT application demonstration projects between 2014 and 2016. It has since been complemented by China’s new “Made in China 2025” manufacturing strategy. The cities of Wuxi and Shenzhen especially have conducted a large part of these pilot projects with application such as environmental monitoring, anti-theft bicycle systems, home security, and agriculture product traceability. Non-Chinese firms like AstraZeneca have also started IoT healthcare pilots. The technologies developed in closed environments are now hitting mass market and are met by actual customer demand. Chinese people desperately look for solutions to fight city pollution levels or enable urban mobility. IoT-enabled payment solutions and smart bike locks are just two solutions that currently enjoy fast adoption all over China on the back of a very quick roll-out of IoT infrastructure (e.g., New communication technologies by China Unicom and China Telecom and cloud backends supplied by Alibaba and Huawei). We believe that in 2018, 7 years after the government first set its foot on IoT, some of the early investments will start to pay off and we will see a number of further IoT projects rolled-out in China and possibly beyond. For remote IoT devices there have never been as many connectivity options as today. For years, cellular has been the safe option for connected infrastructure, containers, meters, pipelines, vehicles and much more. But there are now plenty of new technologies that promise much longer battery life in the LPWA space. 2018 will show how device makers and end-users adopt NB-IoT and LTE-M, following the network roll-out of several large carriers and whether Sigfox and Lora are able to sustain their momentum on their low-power area networks (LPWA). It seems likely that most carriers will end up adopting both 3GPP standards given the only partial overlap on IoT use cases between the two technologies and the low investment to upgrade their LTE network to both (On average a cost increment of only around 20% compared to upgrading to just one). Some operators are already adopting a mixed strategy with high-end 3GPP standards and low-end unlicensed technologies to further increase their market flexibility. At the same time, the entrance of new players joining the market with other technologies such as mesh, satellite as well as 5G (beyond 2018), is likely going to give device makers that are developing new IoT devices a plethora of choices they have not seen before. IoT is the enabler for large scale data analytics and AI. However, so far, very few applications go beyond simple rule management and statistics. There are first exceptions. A railway operator for example is using complex neural networks that scan through past data sets and are able to predict rail occupancy with a striking accuracy. Robots are trained to behave autonomously rather than following a set script. Our IoT prediction in 2018 is that we will see more of these trials employing real AI capabilities. One dominant theme is companies moving from rule-based condition-based maintenance to machine-learning based predictive maintenance. In May 2018, the new EU General Data Protection Regulation (GDPR) will go into effect. The regulation presents a step change in data protection law as it intends to strengthen and unify data protection for all individuals within the European Union. The law targets “personal” information that firms may get from their customers. Consumer IoT devices such as health trackers and smart home devices and connected cars are especially affected. Among other things, manufacturers will have to obtain data processing consent from their users through a clear affirmative act, report data breaches, demonstrate “privacy by design” rules and pay special attention in case personal data of children gets processed. All firms selling in the EU will have to comply, including American and Asian manufacturers. However, for some of them, complying with GDPR has so far not been of utmost importance. We predict that some consumer IoT manufacturers will not comply with GDPR in May 2018 and that it is quite likely that we may even see individual lawsuits against some “non-compliant” firms. A year ago, few people knew about blockchain, the distributed ledger technology. Things have changed and at the beginning of 2018 the value of all cryptocurrencies using blockchain technology is nearing $1trillion with Bitcoin leading the charge. The hype about the technology has also sparked enthusiasm about its use in conjunction with IoT. Most notably, the “Trusted IoT Alliance” formed in 2017 with the goal to secure IoT products with blockchain. A few cryptocurrencies that want to manage smart contracts between IoT devices also emerged. What is lacking are real success stories of IoT blockchain applications. In 2018 we will hear about more initial trials (for example from the IOTA foundation) so that we know how feasible the technology really is for IoT and how far out we may be from mainstream adoption. At this point, we believe that it could easily take 5+ years before the technology gets used to secure individual end-2-end IoT applications in the field or before a significant number of devices autonomously engage in a smart contracts-based data exchange. Internet of Things is unique in the sense that it reaches people and objects that technology could previously not reach. It enables us to better monitor pollution levels, traffic flows, and food chains. At the same time it helps us to optimize water supply, energy usage, and health treatment. All of these contribute to a better world and in 2018 organizations around the world may wake up and understand that there is more to IoT technology than just economic impact – there is a real social impact. Organizations such as the World Economic Forum or the International Telecommunication Union are already at the forefront of exploring this theme and bringing it to the boardroom. One should note that IoT has already seen individual projects centered on sustainability themes such as environmental monitoring or food supply. However many of these projects have primarily commercial goals. We predict that in 2018 we will see first corporations that commit to using IoT technology in order to advance global sustainability – driven by the currently heated debates around climate change, income inequality and poverty. It actually won’t. We just wanted to come up with the most hyped term as part of our IoT predictions, to tell you that when you read things like this you can sit back, relax, take a sip from your coffee mug and laugh at all the companies that load up their marketing slogans with such buzzwords. There are great developments on edge analytics, on artificial intelligence and on blockchain but not jointly and certainly not anywhere close to hitting mainstream. If you are interested in a deeper look at current IoT markets beyond our IoT predictions 2018, you may find the State of the IoT 2017 report helpful which was published in December 2017 (enterprise subscriber-only content). For continued coverage and updates throughout 2018, you may subscribe to our newsletter. In 2018, we will keep our focus on important IoT topics such as IoT Platforms, IoT Security, LPWA, Smart Cities and Industry 4.0 with plenty of new reports due out in the first half of the year. Get in touch for our complete enterprise coverage including access to all reports, research notes, as well as personal analyst time.